After Thursday’s four NCAA tournament upsets, your bracket is probably looking pretty haggard. You’re not alone, of course. But how many others got totally busted by the madness? Since we don’t have access to the personal or office-pool brackets of everyone in the country, the 11.6 million ESPN Tournament Challenge brackets will have to suffice. A whole lot of them made at least one wrong call yesterday. It’s probably not a huge surprise, but the UAB Blazers’ upset of Iowa State was devastating to America’s pursuit of a perfect bracket. 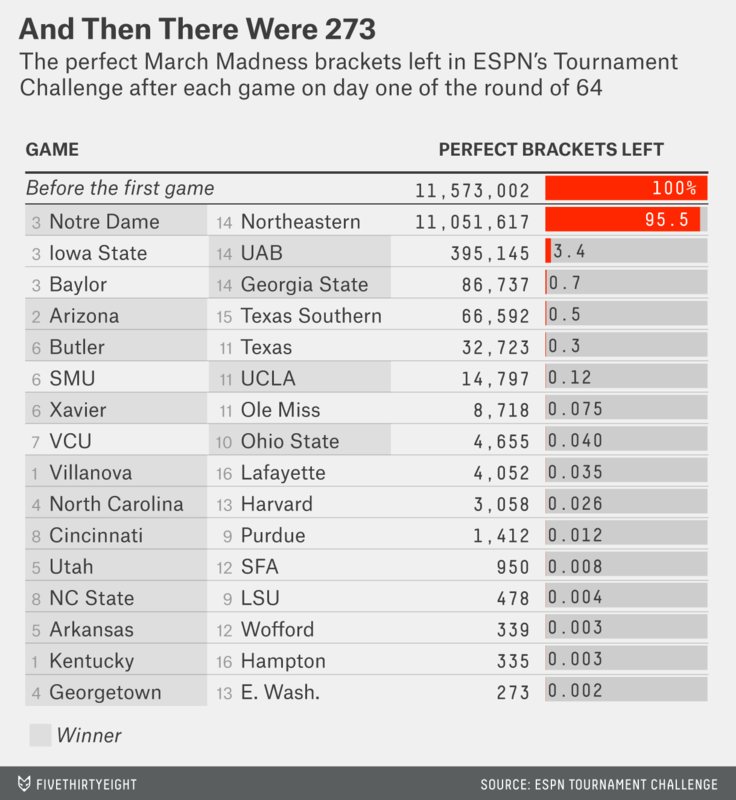 Our model showed a 9 percent chance of that upset happening, and when it did, it broke the brackets of 10.7 million Tournament Challenge players. The following upset — Georgia State’s defeat of Baylor — wasn’t as dramatic in terms of bracket carnage, but it still had a significant winnowing effect: Only 22 percent of the remaining perfect brackets made it through the end of that game unscathed. By the end of the day, only 273 perfect brackets were left. Kudos to the select few who made it. But, as we’ve discussed before, the odds of them making it much further are slim to say the least. CORRECTION (March 20, 12:35 p.m.): An earlier version of the chart in this article mislabeled the seeds of North Carolina, Harvard, Cincinnati, and Purdue. They are the No. 4, No. 13, No. 8, and No. 9 seeds, respectively.